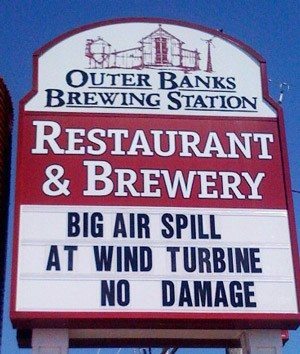 The Outer Banks Brewing Station is the first wind powered brewery in the United States! We were also the first business to produce wind power on the Outer Banks. We pride ourselves in being innovative and conscious about the environment, while helping others learn as much as they can about renewable energy and sustainability. Wind power is the fastest-growing and cheapest source of renewable electricity. US prices have fallen from $0.35/kWh in the mid ’80s to $0.03 – $0.04 kWh at prime wind sites today. Wind energy was responsible for 30% of the new generating capacity that came on line in the US in 2007. Wind has been the fastest growing energy technology in the world for the past decade. Small wind turbines do not burn fuel, so they produce no air pollution. When you generate your own electricity using wind power, you reduce the amount of electricity generated by conventional sources, including fossil fuel and nuclear power plants. In the case of nuclear power, you directly reduce the amount of radioactive waste produced. The turbine has AUTOFURL an automatic storm protection system that begins furling when winds exceed 35mph. The hinged tail furls up to 89 degrees to provide overspeed control. The EXCEL has no shut-down wind speed. The turbine can be manually shut-down using a furling winch installed at the base of the tower. The turbine supplements the power we use here at the OBBS and saves us between $150 and $250 per month on our electric bill (depending on the month). We use 100% of the power the turbine generates. Net metering (or the selling of generated power back to NC Dominion Power) in NC is still not cost effective as Dominion charges us on average $ .11/kWh and pays us their avoided cost or approximately $.035/kWh for the same power! At $200/month using the Net Present Value method our EXCEL will pay for itself in about 11 years. It is designed for 30+ years of service and has a 10 year warranty. A 10 kW Bergey GridTek system will offset approximately 1.2 tons of air pollutants and 250 tons of greenhouse gases over its operating life. How do wind turbines work? Wind is created by the unequal heating of the Earth’s surface by the sun. Wind turbines convert the kinetic energy in wind into mechanical power that runs a generator to produce clean electricity. Today’s turbines are versatile modular sources of electricity. Their blades are aerodynamically designed to capture the maximum energy from the wind. The wind turns the blades, which spin a shaft connected to a generator that makes electricity. Wind power is the fastest-growing and cheapest source of renewable electricity. US prices have fallen from $0.35/kWh in the mid’80’s to $0.03 – $0.04kWh at prime wind sites today. Nine states in the Southeast United States are among the top 30 greenhouse gas emitters in the world. North Carolina is one of them, at number 24. Also, the Southeastern states are ranked as very inefficient energy users, and North Carolina is the worst. Data from a preliminary wind power study in the state shows Dare County as #1 in both onshore & offshore generation potential. Wind Powering America is expected to add $60 billion in capital investment; provide $1.2 billion in new income for farmers, Native Americans, and rural landowners; and create 80,000 permanent jobs by 2020. Wind energy potential increases very rapidly with increasing wind speed. If fact, if wind speed doubles the energy content goes up by a factor of eight. Large wind turbines are used primarily in arrays, called “windfarms.” These huge machines require high wind resources because they must compete with conventional generation (coal, natural gas, oil, and nuclear) at the wholesale level. Large wind turbines are generally not used in “off-grid” applications. Small wind systems are used primarily for individual homes, businesses, or facilities; on-grid or off-grid. Though they cost relatively more than large turbines, small wind turbines can be used in areas with modest wind resources because they compete at the retail level. Large wind turbines have gotten much bigger and much less expensive in the last 15 years. They can already produce electricity less expensively than power from coal or nuclear power plants. Some experts expect large wind turbines to be the least expensive way to produce electricity within ten years. Next: Restaurant And Brewery, Wind Powered?.